Thank you for repairing your ball marks today! Before leaving a bunker, a player should carefully fill up and smooth over all holes and footprints they have made. ENTER THE BUNKER at the lowest point closest to the ball to avoid unnecessary damage to the lip. ON ALL COURSES AT THE VILLAGES, we request that rakes be replaced INSIDE the bunker at 90 degrees to the edge of the bunker. Sand should be used to replace divots taken during a swing. COMPLIMENTARY SAND is available at all Championship and Executive courses. DAMAGE THROUGH PRACTICE SWINGS. Players should never damage the turf during practice swings. 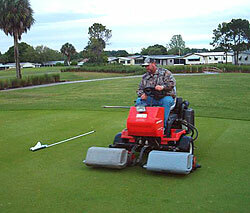 All damage to the course during a shot should be repaired to aid speedy recovery. EACH PRIVATE GOLF CAR OWNER should obtain a sand bucket or container for filling divots. TO MAXIMIZE THE USE OF THE GRASS on the driving range tee, please place your ball at the grassy back edge of your previous divot, removing just a small portion of grass with each swing.